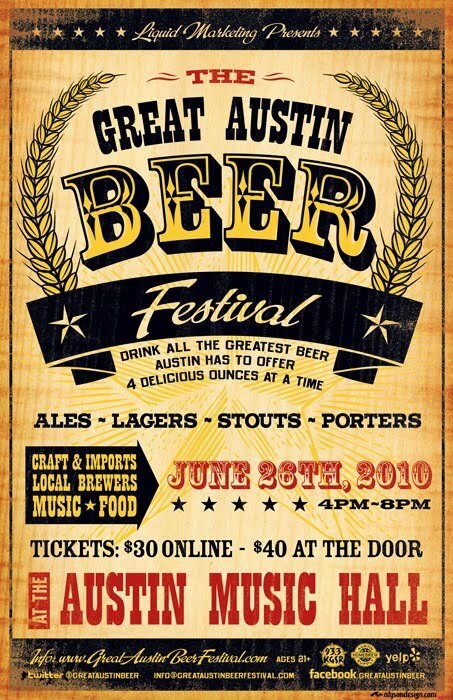 The inaugural Great Austin Beer Festival takes place this Saturday, June 26th from 4pm ~ 8pm at the Austin Musical Hall. Tickets are still available online and at Waterloo in Austin for $30 (plus fees) but will raise to $40 at midnight tonight. About 40 breweries will be participating, including all the local Texas micro breweries, but due to existing TABC regulations, local brewpubs are not allowed. A list of the beers being served has not been made available. I won't be at the beer festival this weekend, I've decided to stay in Houston and attend the events for the first ever Firkin Festival and enjoy some of the great cask beer that will be poured. I also have a ticket for Camp Beer III which takes place on Sunday afternoon.